ANZ yesterday introduced the latest in technology for its EFTPOS terminals for UnionPay cardholders. 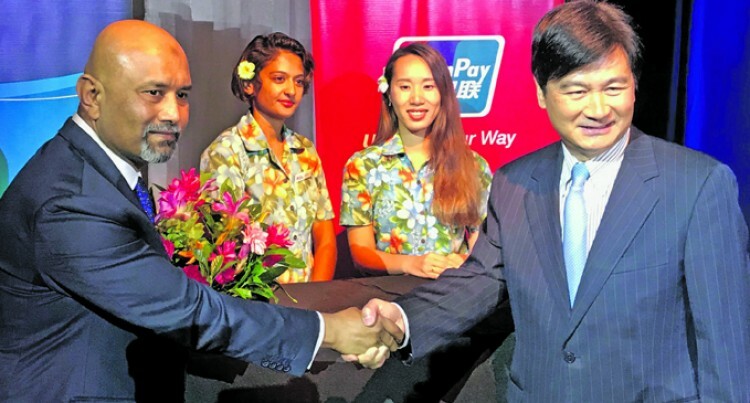 The new product was launched by ANZ Bank country head Saud Minam and UnionPay Chairman Ge HuaYong at the Sofitel Fiji Resort and Spa on Denarau, Nadi in front of invited guests including tourism industry stakeholders and bank officials. UnionPay is contactless technology and be available to its EFTPOS terminals across Fiji, Vanuatu, Tonga, Samoa, Cook Islands, Kiribati, Solomon Islands and East Timor for UnionPay cardholders. “UnionPay is the leading card network throughout China,” Mr Minam, said at the launch yesterday. He said as the market leader in the Pacific, ANZ would continue to deliver new digital initiatives for its customers. “Fiji is a popular travel destination for Chinese tourists,” Mr HuaYong said. “Our deepened partnership with ANZ, our significant partner in the Asian-Pacific region will give our cardholders better payment experience while bring more customers to local merchants, thus realise a win-win result,” Mr HuaYong added. UnionPay cardholders can immediately make contactless payments at ANZ’s EFTPOS terminals and ATMs in Australia and New Zealand. UnionPay wInternational (UPI) is a subsidiary of China UnionPay focused on the growth and support of UnionPay global business. UPI has enabled card acceptance in 170 countries and regions, covering 51 million merchants and 2.6 million ATMs worldwide. More than seven billion UnionPay cards are issued in 49 countries and regions. Meanwhile, ANZ’s Regional Executive for the Pacific, Tessa Price, on Monday welcomed the New Zealand government’s commitment to the Pacific Horticultural and Agricultural Market Access (PHAMA) Plus programme. “Any initiative that helps Pacific Island producers meet global demand is welcomed. “As I travel to rural communities across the Pacific, I see abundant fertile land, under-tapped agriculture and fishing industries, and a young, willing population. “As we outlined in our recent economic report on Pacific Island countries, a richer Asia is providing opportunity for growth. Exports play a key part in supporting this growth, as it brings income and broadens the economic base which will support jobs. “This NZ-Australia initiative will focus on productivity improvements and enhancing product quality. This is sensible; there’s no point in creating external demand if you cannot meet it or supply the products. “It can be hard to navigate regulatory requirements, manage cash flow and stay on top of the day to day work.